Today is our second Baking Chez Moi Tuesdays with Dorie outing, and after the easy peasy Palets de Dames Lille Style, it’s time to show off our first tart. The selection for November is the very seasonal and fantastic cranberry crackle tart. The crackle part comes from the meringue topping that crisps up in the oven. Tart doughs and I have a complicated history. Most of my pans are slightly larger than the ones referred in recipes. For example, instead of a 9” diameter pie dish, I have a 9.5”. I have rolled out the dough too thinly to fit the pan, to the point of where it cracks. To make up for that common (for me) mistake, I made an extra half recipe of dough. Instead of adding ‘half an egg yolk’, I used the whole egg for the total recipe. The upside of increasing the recipe? I have enough dough for a couple of minis the next time we bake tarts. While Dorie’s new sweet tart crust recipe requires no refrigeration prior to rolling it, my Puerto Rican room temperature is closer to 78˚F-80˚F. To play it safe, I refrigerated the dough prior to rolling and kept it in the freezer for a whole hour instead of the suggested 30 minutes after it was placed in the pan. Because perfection is overrated, my tart crusts browned a little too much on the pre-baking stage. Let’s call this French bake and then some! I didn’t mind the extra caramelization, but made sure to cover the edges with foil prior to baking the meringue/cranberry filled shell. I clumsily crushed some the meringue topping while getting the pie out of the oven. My tart became the Arianna Grande of pastry – pictures just from one side, please! The crackly cranberry tart was delicious. I was worried that the cranberries would be too tart, but they were perfectly foiled by the meringue and the fruit jam spread on the bottom. I used a French four-fruit jam: cherry, currants, strawberry and raspberry. It has become a new favorite! It took more than the two tablespoons suggested by the recipe to fully cover the tart shell. 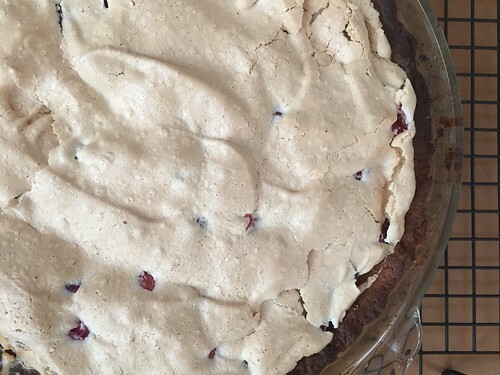 It was even more delicious the next day: the cranberry juices melded with the softened meringue. My co-workers were a happy bunch. They are already wondering what will be the next treat from TwD. If you celebrate Thanksgiving, have a great holiday surrounded by friends and family! Tuesdays with Dorie is an online group where home bakers from all over the world try a hand at recipes from Baking Chez Moi by culinary guru Dorie Greenspan. For the rest of the TWD: Baking Chez Moi links and more tips, tricks and impressions on this wonderful tart, click here. Want the recipe? Click here. I don’t think you need to worry about your baking prowess – it looks like you are going to do just fine! Hope you had/ are having a safe trip home. Great photos! You definitely got your tart’s good side in the picture. Yum! I am making this for thanksgiving, so mine isn’t up yet. Thanks for giving me a preview! I had to use a lot more jam than 2 tb, too. Your tart looks fantastic! Nice and crisp meringue! Your tart looks wonderful and I love the sound of the jam you used – a great match for the cranberries. Your tart looks lovely! I had the same issue with my crust and will reduce the temperature when I blind bake the crust next time. It is delicious! I totally snickered at the Arianna Grande comment. And the tart looks soooo tasty! perfection is over rated-your tart looks beautiful! happy thanksgiving!!! Wokey, I am sold! So going to bake this soon! Beautiful and I’m going on the hunt for that jam (it reminds me of the French fruit tea I love–quatre fruits rouges). That Arianna Grande reference had me laughing. It’s from Bonne Maman, Katie. Hope you find it! Beautiful, good job. I find the temperature given for the oven to be too high for the crust maybe that is why it French baked? “french bake”…I like that. looks good to me, and i’ll keep my eye out for the four-fruit jam– sounds delish! That was actually Dorie’s term for giving baked goods color. There was a bit of discussion in the BCM event I attended last week in DC. This tart was great, wasn’t it. LOL – the Ariana Grande of pastry. Your tart looks great Adriana, a little crushing only added character! I hope your DC trip was as wonderful as it sounded! You are right our crusts did look exactly alike. Definitely going to adjust time and temperature next time. I think I might add this to my Thanksgiving table next year. Looks wonderful! And I agree that it was delicious the next day–perfect for nibbling. I like the look of the browned meringue. I have decided prebaking crusts make them too dark and plan to just prebake them a shorter time and see what I think. 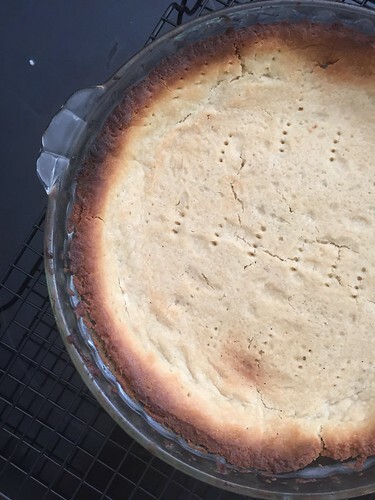 I love this tart crust–so simple to make. Gorgeous color on your meringue! Your tart turned out beautifully! I think a crackle tart is made to be crumpled. At least, that’s what I told Kevin when he asked about the hole in the top that mysteriously appeared between the cooling rack and the table. It had to be tested, after all. I too needed to add extra jam, and I used the recommended size pan. Next time, I would add even a bit more, as well as more cranberries. This was an easy recipe and makes for a pretty presentation when cut. It was well received at our TG table. Your tart looks wonderful. We had opposite room temps to your Puerto Rican room temperature, up north we were in an epic snow storm that later brought below zero temps. 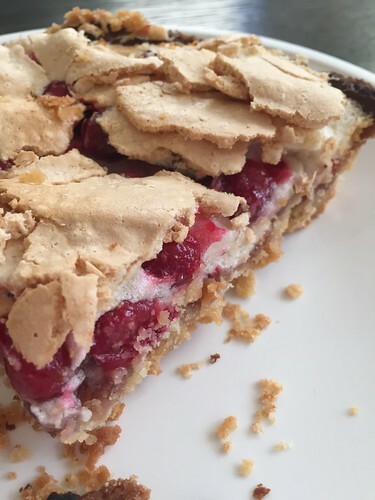 However, the Cranberry Crackle Tart turned out great in both environments. A good recipe with smart bakers is a great combination.